Improve foot health and comfort all day. Anti-bacterial Silver Steps™ gel bunion toe spreader with straightening loop aligns big toe and second toe to prevent irritating overlap and reduce pressure and friction. 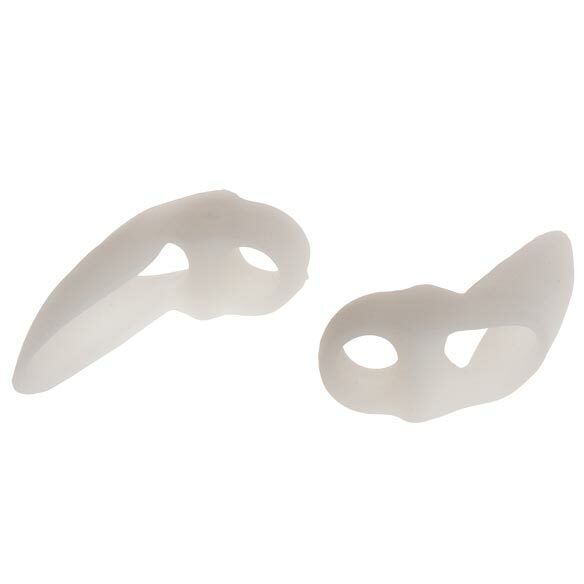 Soft gel bunion brace cushions and relieves bunion pain. Bunion toe straightener is ideal for instant relief and long-term correction. Anatomically shaped for comfort with or without shoes. Contains 1 pair, right and left. My second toe was lying over my big toe. I had seen about surgery but had family obligations at this time that I could not commit to eight weeks recovery time. Finding this product was so great. I could walk without pain and do the things I had to do. Thank you for this product. These fit nicely on my toes and work well under socks. Don't even know I am wearing them. Comfortable! Using them to help straighten my toes and help with balance. They are working! Can wear alone while at home or with shoes when you go out. Have a big bunion and using this has helped ease the pain I felt while sleeping. The first day i wore the bunion pad.it was a lil discomfort after a while it was comfortable. I use it everyday and it is helping me. haven't found another product that encircles big toe so this is perfect. This type of toe straightener helped me with my hammertoe problem. It holds my second toe (next to the big toe) in correct alignment and is so comfortable I barely feel it's there. If I could make it perfect, I'd extend the "bunion" portion to cover the side of my big toe. I don't have bunions, but on the side of my big toe, I have a bunion-like callous. This gizmo doesn't quite cover that, but it does such a good job with the hammertoe problem that I use it often. This bunion toe spreader is comfortable , but I haven't seen much improvement. It tore after 1 week of usage. It tore after one week! It didn't fit in my shoe. felt great but tore after first use between the toes even after using heavy cotton socks. I would not recommend. Needs stronger material. A good idea, but it tore in half during the second days use! day of use. Would not recommend this product. this item is not durable. it fall apart after short use. I have made several purchases of this product with the same poor outcome. it falls apart after a few hours of use. The Gel Bunion Toe Spreader as advertised appeared to be exactly what I needed. but when it arrived I found it to be very poor quality and useless. I intended to return it to Walter Drake, but thought it would be a waste of time to repackage it and ship it back. Instead, I will just discard it and forget about it . This product doesn't work I will not buy it again. I put it on every day on my toes . I need it for my foot. The ones I buy @ Walmart tend to tear so I am thinking that with this extra loop around the second toe, it will help it to not tear. I have a bunion hope it will help. Hope it would help my problems. My wife has problems with those toes. This is our first attempt to solve.The price indicates there is value in your product. I am trying them to see if they will help straighten my toes out. I purchase this gel bunion to help ease the pain on my right foot. Toe spreader with loops, because it looked like it would work for me. Perhaps it will help my husband's toes. Hoping it helps same problem. I've tried spacers but I need a straightener feature, since my toes have moved so much. These are the only ones that work. Thanks a lot. Protection for my bunion and a crooked second toe. I am beginning to get a bunion on one foot so thought this might keep it from getting larger. Have used this before and boy does it do the job. Looking forward to using new ones. I have a bunion on my left foot and i hope this works. does this feet on both feet? BEST ANSWER: I had bought a few different products for my mom and husband. The one I was talking about was the ring around the toe with a gel spacer. My husband did not like the one that was pictured after I completed the inquiry. Thank you for your question. Yes the toe spreader comes in left and right. We hope this information will be of help to you. I bought this for my mother. She absolutely loves it. She uses it to keep her 2nd toe separated from her big toe.